Where do you live? In the settlement Maale Michmas, about 20 minutes north of Jerusalem. 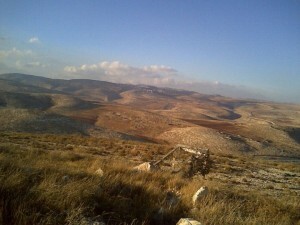 The gorgeous view from Maaleh Michmas. Photo by Esther Rosenblum. Outside of mothering, what do you most love to do? Baking, and working out. I especially love zumba …it’s what keeps me sane! Are you FFB or Baalat Teshuva? Baalat Teshuva! What’s your favorite part of being a mom? I know that I am really blessed – I started having kids right after my marriage. 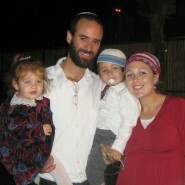 And that’s not always easy, but I know that I am doing Hashem’s will raising my own part of Am Yisrael. It’s sometimes not so clear what is your purpose in life until you become a mother and you have little kids who NEED you. 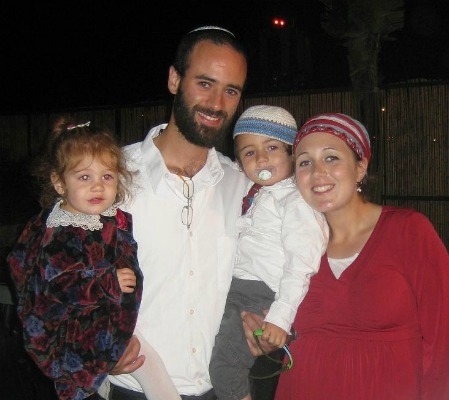 Even though I barely daven anymore like I used to, and barely go to shiurim, now that I am a mom I feel more connected to Hashem and am constantly praying for the well-being of my children. Since I became a mother, I also feel more connected to my own mother as I (almost) understand the struggles she went through. What’s the toughest part, for you, of being a mom? I need personal time on my own, and that’s been the biggest challenge for me since I became a mother. I just cannot be at home all day with the kids. When I first became a mom, it was especially difficult for me to make the adjustment from living near a city to living in a small settlement in a caravan with only a few buses a day and a non-functional makolet (corner store). I felt like I was losing my mind! That’s why I prefer to be a working mom (part time at least) since that means I get out of the house. The kids go to a wonderful day care at the settlement, and I come back from work ready to spend quality time with them. What’s the best advice for moms you’ve ever received? It’s important to put down what you’re doing and give your kid attention. Even if I’m cooking or working on the computer at home, if one of my kids comes to me with a book or a toy, I learned that it’s worth it to stop what I’m doing and give them my full attention for a few minutes. My kids really appreciate it when I sit down on the floor with them and a toy, and it only takes a little bit of time, and then they are fine playing on their own. I also learned that picking up my babies whenever they want it makes them so much more independent in the long run. I actually see a big difference with my firstborn and my second, who was always attached to me for the first year! How did you hear about JewishMOM.com? I started watching the Mini-mom videos on the website right after my first son was born- I don’t even remember how I stumbled upon them. I was by myself all day, in a dingy caravan in the middle of nowhere, with a newborn, still trying to adjust to my recent marriage/Aliya/move to a settlement (I got married a month after my Aliya, and got pregnant immediately). The videos helped me a lot, because I didn’t feel so alone- I realized motherhood is not easy, but I can do it too! What’s your favorite part of JewishMOM.com? I really enjoy reading other mothers’ inspiring stories…and reading how women have overcome so many different hardships. It’s not easy being a religious Jewish woman- it’s so important that we connect to each other to give support and advice! I am always amazed at these women who go through so many changes at once and still come out smiling: teshuva/aliyah/marriage/pregnancy….!!! You give Hashem a lot of nachas. love your mothering insights – thanks! You sound like such a wonderful mother and person!